At the end of the last post, Judge Nathan Q. Tanquary – who had been presumed dead for just over a month – unexpectedly communicated to his wife that he was in Peru, and heading home to Texas. Upon his return to Fort Stockton, the judge lost no time in explaining what had befallen him in Alpine and the strange odyssey he embarked upon afterward. 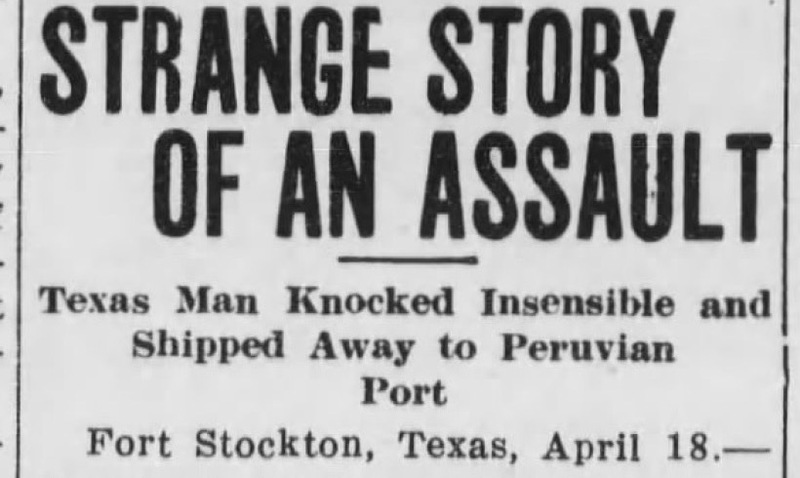 He wrote his whole story to the El Paso Herald, as a thank you for their support during his time of need, and they ran the story on the front page on the 16 April 1913 edition. I’m leaving the judge’s article just as he wrote it. “I take this opportunity to thank you personally for the stand which your paper has taken in my behalf during the terrible ordeal which myself and especially my family passed through. I assure you it is no small matter to have some one stand for you when a great crisis is on., and I think it is due to you that I write you as fully as I can, what occurred. On the morning of March 1, I left my home for Fort Stockton, attended to some business there on the 3d and on the morning of the 4th appeared as a witness before the grand jury then in session there. Leaving there, I went immediately to Alpine to look over and pay for some reservoir work which I was having done for Mr. Murphy some 13 miles out of Alpine. I had some cash with me, about $250. This reservoir work is not on the Alpine road but the road made from the camp comes into the Alpine road about 10 miles out from town, and here I met Ira Hector, the contractor for this job, and in talking with him, I learned he would expect more money than I had, hence I went into the bank of Alpine and cashed two drafts amounting to $500. While on this road, I made arrangements with Mr. Hector to come there that night and stay over night at the camp. After transacting the business at the bank, I went to a restaurant in the Masonic temple and had lunch about 4 o’clock in the afternoon and an hour or so later, started for Hector’s camp in my automobile. While I was at lunch, a man I had never seen before, but who called me by name, came in and talked with me about going out to the Hector camp and after a suggestion or two on unimportant matters, went out. Although as I say, I had never seen this man before, I would know him now among a thousand. When I had got out a few miles from Alpine, I overtook this same man walking in the same direction I was going. He stepped out to the right hand side of the road and indicated for me to stop, that he wanted to speak to me. When I had stopped, he asked me if I had met anyone in an automobile. I told him I had not unless it would have been just as I was coming out of Alpine. He explained to me that he had just come into the road and was looking for someone in an automobile and thought they might have passed before he came into the road. In the meantime, my engine, which was not in very good working order, stopped and I had to get out to crank it. I remember absolutely nothing after that for several days. I do not remember any one striking me while I was on the ground or at any time, yet from the terrible pain, I know that I was struck on the back of the head. And the surgeon who examined me at Callao said that the blow was delivered just at the base of the brain. Whether I was afterwards drugged, I do not know, but the taste in my mouth and the feeling I had was not like that I have after being at a Woman’s Club banquet. Everything even now seems a blank. Although I have a hazy recollection of being on a dark closed car, but it is too indistinct to give anything definite. When I recovered consciousness, I was in a small cabin on some blankets on a freight boat with no one on board except a small crew of Peruvians, who were taking a cargo, principally oil, to Callao, Peru. None of these men could speak a word of English but as nearly as I could learn from them, they were on the Gulf of California below Guaymas, and after a day or two they wanted money from me to pay fare. I finally managed to gather from them that someone brought me on board and told them that I was in poor health and was going to Palia for my health, that I had plenty of money and would pay them well. I succeeded in showing them, I think, making them fully understand, that I had absolutely nothing. Not even a watch, pen knife or a paper of any kind or description. I stood absolutely stripped of worldly except my clothes, and no friends in sight. I think I made them understand that I was there against my will for when they understood they were very kind and gave me as good as they had. They offered to take me ashore at two or three places, but these places were small and no way out, hence I preferred to stay with them until I might find a place with English speaking people. When I reached Callao, their destination, I found, almost immediately a J. W. Hazlett, who some years ago lived in Colorado Springs Colorado, when I tried a law suit there. He and J.P. Johnson assisted me in arranging and getting some money for a little clothing and my expenses home. I might add that when I left Alpine I had on my person some papers which might have been thought to be of great value in a case pending at Fort Stockton, but which were really of but little value. Again thanking you for your good spirit in this matter. I wish I had been able to find a picture of the judge, and I really wish he had provided a bit more detail about those Woman’s Club banquets he attended. I don’t know, you guys. Even with Judge Tanquary’s unimpeachable reputation, there’s something about this whole story that seems just a lit-tle bit fishy. I happened to read the judge’s explanation while I was looking for something else, and I thought it was a joke – like The Onion, circa 1913. But it turned out to be a real story… though whether the judge was being 100% truthful may be up for debate!